Composed by Nigel Hess (1953-). Series; Solo; Solo Small Ensembles; String - Violin and Piano. Faber Edition. Movies. Part(s); Score. Faber Music #12-0571533965. Published by Faber Music (AP.12-0571533965). Nigel Hess's most recent film score is for Ladies in Lavender, the feature film directed by Charles Dance and starring Dame Judi Dench and Dame Maggie Smith. 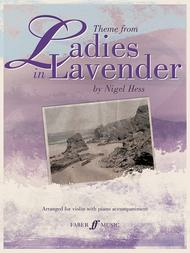 Nigel has arranged the main theme from the film for Violin and Piano. The soundtrack, performed by virtuoso American violinist Joshua Bell and the Royal Philharmonic Orchestra, is now available on Sony Classics. More information on Nigel Hess and his other works can be found at www.myramusic.com. November 17, 2011 One to make the audience weep. that Nigel hess understood the instrument when writing this piece. One for the violinists who like the theme of Schindler's List and Massenet's Meditation. anniversary in Slovenia. Everyone that hears the piece simply loves it!